World-class sculptor Milton Hebald is Santa Fe's secret treasure. Having lived and worked in Rome for over 40 years, the internationally renowned American sculptor, Milton Elting Hebald, returned to the United States in 2004 at age 87. His work which is on display at the Pushkin Gallery in Santa Fe represents an incomparable opportunity to view "one of the most important living figurative sculptors in the world," in the words of Kenneth Pushkin. It was during Santa Fe's renowned "Russian Summer," when Pushkin produced the ballet ‘Onegin' at the Santa Fe Opera that the sculptor approached him after the performance and introduced himself. "He told me that he had just moved here and had a lifetime body of his work in a warehouse south of Santa Fe," Pushkin relates. 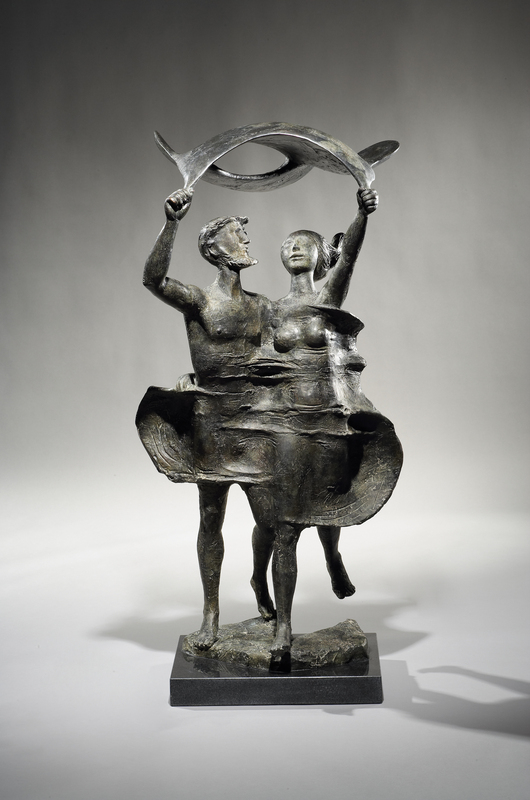 Already familiar with Hebald's art, (found in the permanent collections of the Museum of Modern Art and Whitney Museum of American Art in New York, the Guggenheim Museum, the Smithsonian Institution, and numerous other top museums and public sites worldwide), Pushkin was elated to offer representation to the sculptor-and in the process re-introduce American collectors to this artistic treasure. Milton Hebald was born in New York City in 1917, and has said he cannot remember a time when he didn't already know he was an artist. As a preschool-age boy he used colored chalk to make large-scale drawings on the city's wide sidewalks, including a likeness of a Fifth Avenue double-decker bus, drawn from life. But it was at about age eight that his connection with sculpture began. He was given a box of modeling clay in colored strips. He recalls experiencing an immediate resonance with the medium, and his path in life was set. Even at a young age, Hebald and his three sisters enjoyed visiting the Metropolitan Museum of Art, which, he remembers, "I considered my own personal museum." After recognizing a strong attraction to sculpture, he picked out two of his favorite sculptors living in New York and somehow managed to get himself invited to their studios for a visit. At age 10 he became the youngest student at the Art Students League, where he studied life drawing. At the same time he began taking sculpture classes at the School Art League. Hebald won his first national sculpture competition, a soap carving contest sponsored by Proctor & Gamble, while still in high school. Also during high school he continued his study of sculpture, attending the National Academy of Design and the Beaux-Arts Institute at night. Hungry for classical art instruction that wasn't available to someone of his family's means-his father, an immigrant jeweler from Poland, had been killed during a robbery when Milton was six-he constructed his own forms of discipline. Among other things, he studied and meticulously copied reproductions of paintings by the Old Masters in books at the public library. His first major works were collected by the newly formed Whitney Museum of American Art in 1932 when the artist was only 15 years old. With no doubt about his career of choice, Hebald left high school in the middle of his senior year. He secured his first studio, which he was allowed to use rent-free in exchange for showing other lofts to potential tenants. At age 20, he was given his first one-man show. The exhibition was the prize for winning the annual American Artists' Congress competition, and earned enthusiastic critical reviews. At the same time, he became a member of the Sculptors' Guild. Hebald's earliest pieces were sculpted in plaster or wood, since bronze casting was beyond his financial means at the time. Even today, plaster remains his favorite sculptural medium. He builds up and carves it, and then has the work cast in bronze. His bronze portraits, on the other hand, are initially formed in clay or plasticene. From the start, Hebald's artistic expression has focused on the human figure, individually and in groups. His inspiration has come from literature-including Shakespeare, Whitman, and Melville-Greek and Roman mythology, the Bible, and the everyday observation of people around him. While his figures may occasionally be tragic or dark, more often they present a sunny, cheerful, often humorous perspective on life, reinforced by a lively, rhythmic sense of movement and astute use of negative space. As Frank Getlein, Hebald's biographer has put it, the sculptor's oeuvre is "an intensely humanizing body of work, each piece is filled with an energy and vision unmoved by artistic fads or the critic's opinion." A major element of Hebald's career has been public commissions, the most visible of these being Zodiac Screen, a row of large bronze zodiac figures on the glass-fronted Pan-American terminal at JFK International Airport in New York. Other prominent public pieces are located in New York's Central Park, the Hague, UN Plaza, Tower Museum in Dublin, AIG Building in Tokyo, TWA Building in Los Angeles, Tel Aviv Museum, Oslo University in Norway, Yale University, Sun Times Building in Chicago, and many more. Perhaps one of his most famous works is a life-size memorial portrait of James Joyce, installed at the writer's gravesite in Zurich, Switzerland. It was one of Hebald's earliest large-scale commissioned works that first took him to Rome, where the piece was cast at one of the world's most respected foundries. He soon entered and won the Prix de Rome (the first of three times he earned the coveted award), granting him a lengthy stay. The sculptor and his wife, the late Cecille Rosner, fell in love with Rome. Together they built a beautiful villa on the hilly shores of Lake Bracciano (30 km north of Rome) as well as an expansive studio. There they lived, worked and entertained the most famous artists and celebrities of the era. Acclaimed by critics as the spiritual heir of Auguste Rodin, Hebald's long, successful career has shown him to be "the modern master of the figure," Pushkin notes. The sculptor's innate knowledge of anatomy, combined with a high level of technical facility and emotional sensitivity, puts him on a level that is "unparalleled in contemporary figurative sculpture," the gallery owner asserts, adding, "He deserves the great tribute that is coming his way." 1990 / Bronze / 33 x 7"
1992 / Bronze / 48.00" x 27.00" x 21.00"
1965 / Bronze / 60.00" x 24.00" x 40.00"
1974 / Bronze / 37.00" x 41.00" x 25.00"
1955 / Bronze / 62.00" x 15.00" x 13.00"
1977 / Bronze / 34.00" x 12.00"
1981 / Bronze / 24 x 48"
1940 / Wood / 10.5 x 36"
1988 / Bronze / 29 x 16"
1986 / Bronze / 18 x 14"
1958 / Terra Cotta / 45" x 21"
1961 / Bronze / 63 x 20"
1984 / Bronze / 34.00" x 20.00" x 14.00"
1968 / Bronze / 21 x 19"
1960 / Bronze / 21.00" x 30.00"
2001 / Bronze / 12 x 19"
2002 / Bronze / 14 x 16"
1992 / Bronze / 20.00" x 24.00"
1959 / Bronze / 54 x 21"
1957 / bronze / 12 x 8"
1947 / Bronze / 18 x 8"